As much as I adore Elizabeth Zimmermann, until recently I didn’t have a single EZ FO to my name. You may remember the Tomten Disaster of 2007. What? You don’t commit to memory every woe I blog about? Well, there was a Tomten Disaster that involved running out of yarn, moaning about it all over the internets, and having a very kind person coming to my rescue. Only, by then the Tomten Mojo had weakened, and I couldn’t finish before warm weather arrived and obviated the need for bulky hooded sweaters. I still have high hopes for a pair of Tomtens (this spring, perhaps?). Many nights I bring one of my three EZ books to bed. I don’t know why, but I find it endlessly entertaining to read the same chapters over and over again, and stare at those same dim black-and-white photographs, and imagine them in colors of my choosing. I finally decided to do something about it, and in December joined a Knitter’s Almanac KAL on Ravelry. I don’t know if I’ll actually follow the book month-by-month, because I’ve got plenty of other knitting goals this year, but for now I’m having a lot of fun letting Mrs. Zimmermann lead the way for me. So when I realized that my sons’ Co-Op Preschool would be having a Silent Auction in February, it didn’t take me long to figure out what I’d be making. With no babies in my own life to knit for, especially of the female persuasion, I jumped at the chance to make my first ever February Baby Sweater…. … and hat, and blanket. modifications: I didn’t make buttonholes as I went along, primarily because I forgot (the pattern doesn’t make them explicit when you would expect). When I realized I had left the first one out, I decided to keep going and add afterthought buttonholes later. 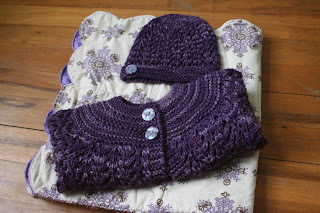 Only once I got done with both the sweater and the matching hat, I had approximately 10 inches of yarn left. I didn’t think that would be enough to do the buttonholes. So I went a different route, and tried snaps for the first time ever. 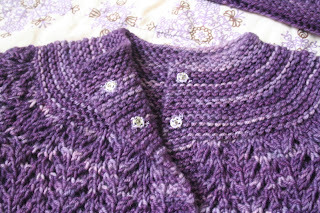 In the end, I was pleased that I had forgotten the original buttonholes, because it gave me the opportunity to consider my preferences for buttons after the sweater was complete. I got to try out multiple options before committing, and I quite liked the effect of the two buttons at the top. 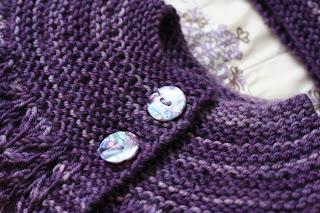 The buttons themselves were so sweet – little lilac shell buttons that were ridiculously hard to photograph. In terms of other mods, I also knit the body first, just because that’s what feels most natural to me, and then knit the sleeves in the round, because why seam? (I’m still a little perplexed as to why the Queen of Seamless would have us knit these flat). verdict: There’s a reason this pattern is so popular. It knits up quick and easy, and the final effect is what I would actually call heirloom quality. 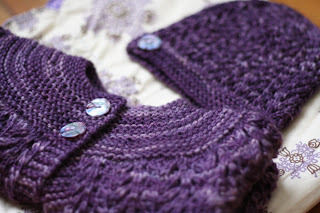 Such a beautiful baby cardigan, and not in a frilly or frou-frou way. 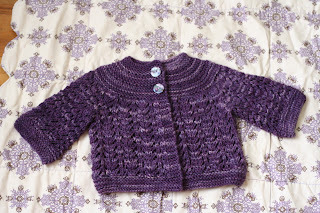 This is going to be my new go-to baby sweater, at least for baby girls. The Socks that Rock was a great squishy option for this sweater, and the color was amazing. Yardage is great too, but I overestimated how much stuff I could make from one skein. 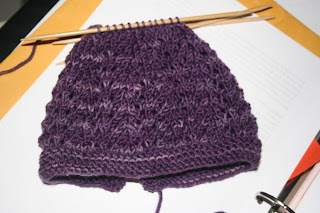 My original plan was a sweater, a hat, and a pair of Saarjte’s bootees, but as it was I barely had enough to finish the hat. Next time I might use Dream in Color Smooshy, which looks to have enough yardage for all three. That’s how far I got the first try before running out of yarn. So I had to frog and try again in a smaller size. 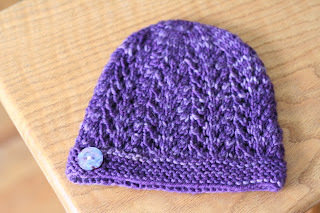 pattern: Just a basic baby hat with garter brim and gull lace. I cast on 63 (9 pattern repeats) and decreased based on how I estimated I was doing yardage-wise. 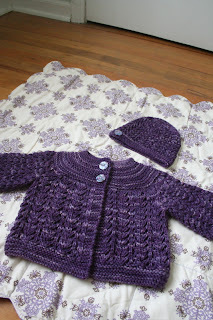 If you’re looking to do one of these, teeweewonders has great instructions in her Ravelry notebook. verdict: I love it, especially with the shell button embellishment. notes: I screwed up in multiple ways in the beginning and never fully recovered. 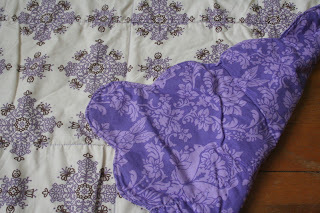 #1 – I failed to take into consideration the directional nature of the rabbit fabric when cutting. There were two ways to deal with this once it was done (given that I did not buy extra fabric). I could’ve kept the dimensions as they were and let the bunnies run horizontally across the back (as opposed to vertically, which is how I’d envisioned them). Or I could cut all the fabric smaller to make the rabbits run vertically. That’s what I did, which resulted in a blanket that was smaller and more squarish than the pattern indicates. That was not ideal but it was all right (it also means I got to keep a few scraps of the yummy rabbit fabric). 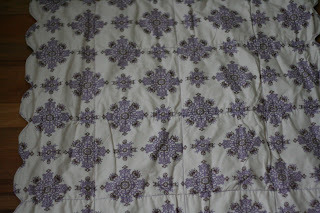 #2 – When I traced the template onto the front fabric, I didn’t get it square. So the scallops on the final side did not meet up right. Instead of completely re-drawing, I tried to fudge it. So a couple of the scallops on one side were not quite the same size as the rest. I thought it wasn’t that noticeable, but when I look at pictures now I realize it was more noticeable than I thought. 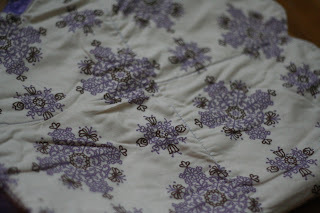 #3 – After this mess, I – for reasons I can no longer recall and surely make no sense at all – decided to disregard the directions and cut the fabric along the scallops instead of using the scallop line as my sewing line and then cutting. DO NOT TRY THIS AT HOME. This made for nearly disastrous sewing, as I attempted to sew all the scallops 1/8″ from the cut edge. It would have been soooo much easier (and faster!) to sew on a drawn curve than that close to a cut curve. This made making the blanket not near the joy it could’ve been, and it made the scallops turn out less even than they should’ve been. In retrospect, I should not have contributed this to the auction, as I am completely embarrassed now when I look at the photos. I thought perhaps I could make another one just like it, but better, to send to the person who bought it, but now I see that the rabbit fabric is no longer available. I still might try again, with a different back fabric. I know now that the key to getting it right is making sure to square up everything when drawing the scallops from the template. In the end, the Silent Auction was a success. The school raised several thousand dollars, I got a steal on a child-sized solid wood table and chairs, and my little baby set sold, for $50. Less than the cost of materials, but I had feared it wouldn’t sell at all. I love the color, and it looks squishy even in photographs. That’s some lucky baby! 1. I love the snaps! That’s a brilliant solution. 2. That baby blanket is SUPER cute, and matches so perfectly. 3. The hat! My ovaries, normally very silent in the face of babies, are piping up. I’m disappointed that the set didn’t go for more–that is CLEARLY worth far more than that. Like you, I think this wee set is amazing, as it’s such little effort, for such a great result! Thank you for the eye candy this morning. Your sweater and blanket are beautiful. I love the colors. That baby will certainly feel the love. I’m also an EZ fan, I struggled through the Adult Surprise Jacket and I’m so glad I did. Never point out your errors, no one else will notice them if you don’t. Have a great weekend. The snap buttons are perfect! I may just ‘borrow’ that idea later on, if you’re ok with it. As for $50, whoever purchased the set got a STEAL of a deal! You’d easily pay close to that just for a good blanket, let alone handknit goodies. Very nice work, and congrats on a sale for the school! It’s gorgeous, a one of a kind set. Sooo sweet! I love it! And the snaps are genius.. 😉 –Jill P.
Ok, I have to get pregnant now, just so that I can knit that sweater. In that color. And then make that very same blanket to go with it. The whole thing is just precious! I can’t believe that it only went for $50! It’s worth far, far more. Beautiful! The STR works really nicely for the FBS. Love the hat too! 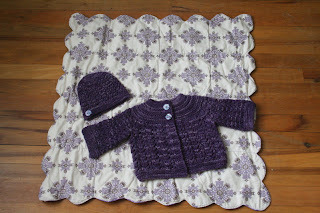 The baby blanket is beautiful and the sweater and hat luxurious. You are so tempting me to get my machine out. I’m glad to hear I’m not the only EZ bedtime reader. Gosh! How many times have I read “Knitting without Tears”, and it still holds a charm for me. Suddenly I have the urge to knit baby garments/items (I wonder why) and this sweater and the BSJ are the first 2 I HAVE to knit. Your version is gorgeous! And what a perfect set with the hat and blanket. And the snaps? Genius!! I’m sure a much preferable option when dressing a fidgety baby. What a beautiful set! The color is perfect. Oh, that is too adorable. I love how unexpected yet perfect the purple is as a baby color. Ad I agree with everyone else, that set should have gone for way more than $50. I really like this set. both the sweater and blanket are on my to make list, and I think everything looks smashing. $50, highly underbid. SO beautiful. I would never have noticed the scallops had you not mentioned it. If I want perfection, I can buy it at Target, you know?! Its just completely charming, and I’m sad that I wasn’t there to outbid that lady! What a beautiful set. Sold on EZ and raising money for a good cause! Congrats.